This article will explain how you may access the contents of a common cartridge. It is not necessary for importing the common cartridge into another Learning Management System. When downloaded a common cartridge will have one of two file extensions. The file extension can be changed from .imscc to .zip for easy access to the contents of the common cartridge. However a simple zip file cannot simply have the extension .imscc added in order to create a common cartridge. How to have you zip and cartridge too. The following steps are recommended to avoid accidental loss of a useable common cartridge. 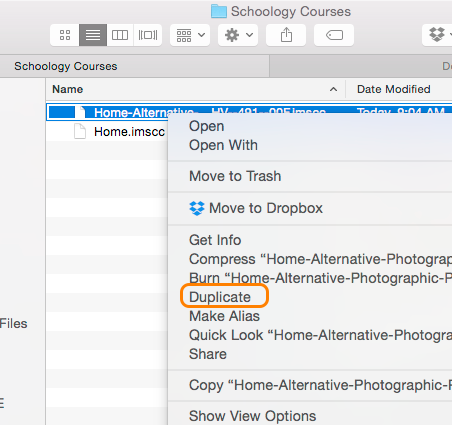 Duplicate or copy the file. Once a file is duplicated it can be renamed. Selecting the file name once and then again slowly (not a double click) will open the name to editing. Opening the option menu for a file will allow Get Info (Mac) or Rename (PC) to be selected. Change the extension from .imscc to zip and hit Enter/Return to confirm the change. If a mistake is made before hitting Enter/Return, simply hit the Esc key on the top left of the keyboard. This will escape from the edit and allow the user to start over. 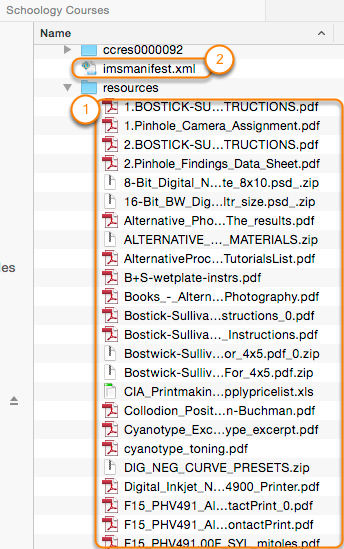 If Esc doesn't help, then the reason for duplicating the file first should be obvious. The Mac will ask for a confirmation when an extension changes. Known extensions may be hidden on the PC. After changing the extension to .zip the extension my disappear. The Mac should expand the .zip into a new folder and leave the original .zip as well. Which will result in 2 files and a folder. The user may choose to keep the zip file or delete it. Again a reason to duplicate the original before starting the process. An accidental deletion can ruin a user's day. Window's XP and up should allow the user to simply open and explore the zip file without any need to expand it. 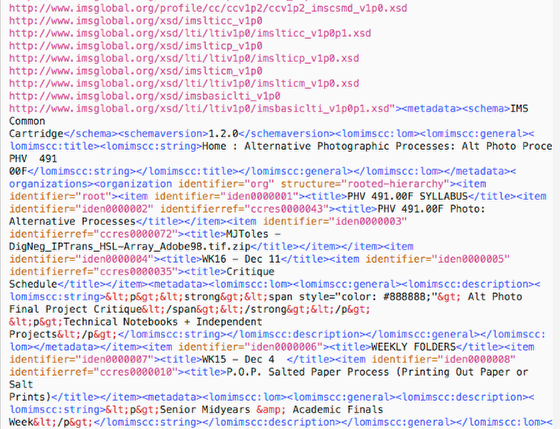 In this case there will only be the .imscc and .zip file. No file deletion should take place. The Common Cartridge will have nested folders. Nested refers to a folder inside another folder. Like the Russian Nesting dolls. 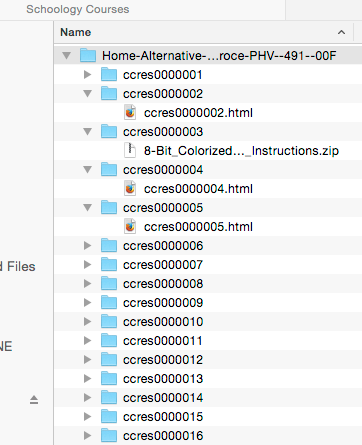 Depending on how the resources where organized there can be any number of files in each folder. Files can be removed or copied from the expanded common cartridge zip for use elsewhere. An edited file should not be replaced into the .zip and expected to work in a common cartridge import. For the curious user that is not curios enough to open the file, this screenshot shows the basics of what can be found.